Imagine a world without safety fences, a world in which humans work side-by-side with robots. In this world, robots would execute all strenuous tasks, enabling humans to dedicate their precious time to lighter, more skilled or demanding tasks. 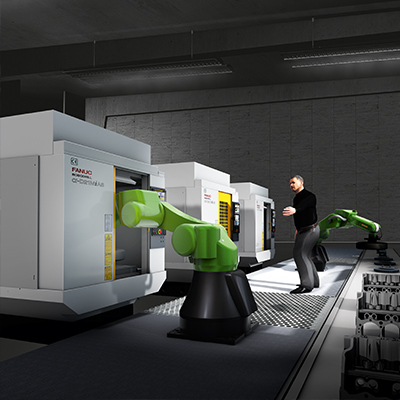 With FANUC collaborative robots, that world has already come into existence. By integrating them into existing production environments, robots directly collaborate with humans, becoming a crucial part of the team. Alongside humans, they take over tedious, repetitive tasks, lifting up to 35 kg, thus maintaining the human’s health while automating entire assembly lines. Barriers to collaboration are a thing of the past, since CRs and humans safely share the same workspace and work side-by-side without the need of any safety fences. 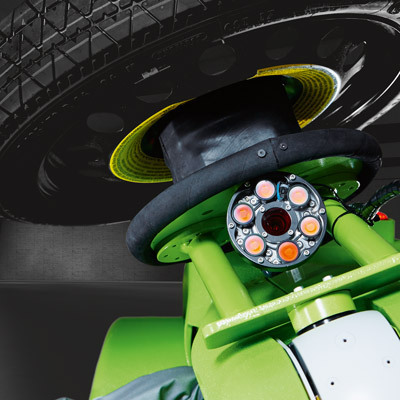 Based on a safe contact stop, FANUC CR immediately halts its current task and stops after collision with a person or a fixed object thanks to its proven sensor technology. 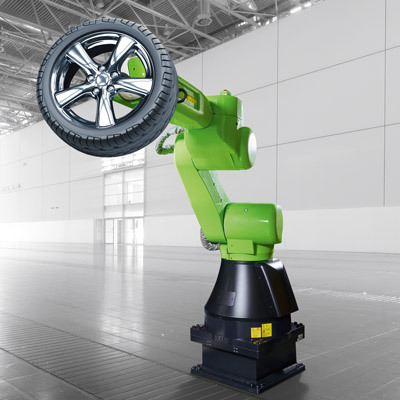 The FANUC collaborative robots family can handle payloads up to 35 kg, making the CR-35iA robot the world's strongest, collaborative robot. 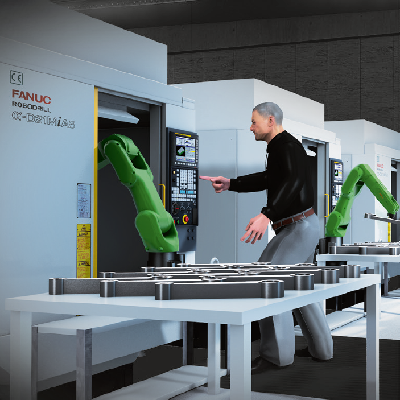 FANUC Hand Guidance allows you to teach your collaborative robot by leading it through paths and/or use it to lift heavy objects manually. This is made possible by an emergency stop button and a three-position enabling switch that meets ISO 10218 and ISO/TS 15066. 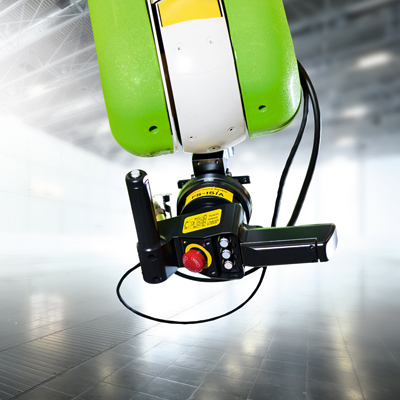 Depending on the needs, the CR robots can be equipped with a FANUC Vision Sensor or a FANUC 3D Area Sensor, which enable them to locate or envision workpieces. 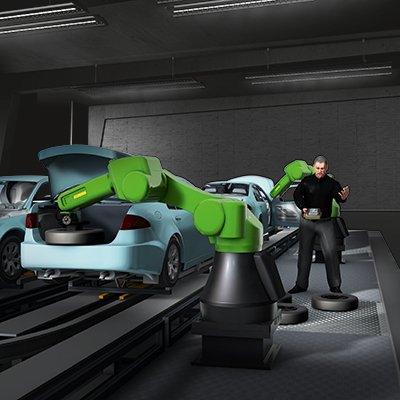 Despite its green exterior, the CR family operates like any other FANUC robot and is able to repeat the same movement multiple times at the exact same dexterity, leading to the automation of entire assembly operations of various industries such as of the automotive, packaging, distribution and metalworking industry. To relieve their employees from heavy lifting STIHL added a CR-35iA to their production line in Waiblingen, Germany. At their production in Schwandorf, Germany simple tasks such as parts transportation are handled by automatic systems and thus make the work place more ergonomically. Preventing the risk of repetitive strain injuries amongst assembly line workers, the CR series will lift and position heavy components on machining and assembly lines. The repeatability offered by using a collaborative robot for these processes also improves quality and reduces cycle times. The CR series is ideally suited to those machine tending applications that frequently require an operator’s presence. Eliminating the need for an additional workstation, the robots can also carry out quality control checks as part of the handling process. 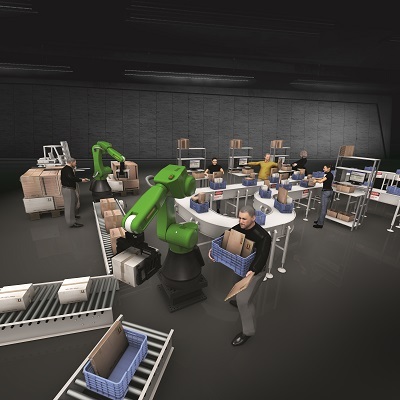 On packaging and palletising lines, the CR series can be used to carry out dull, repetitive, dirty and dangerous handling tasks, freeing up staff to perform more complex and diversified jobs requiring human skills. Whether they are used to apply sealants, adhesives, paints or other fluids, the CR series works safely next to humans across a range of industries. How can we help you increase your productivity? Our specialists are looking forward to supporting you.